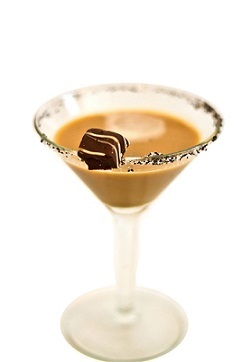 This restaurant Chocolate Liqueur Recipe is "dessert in a glass." 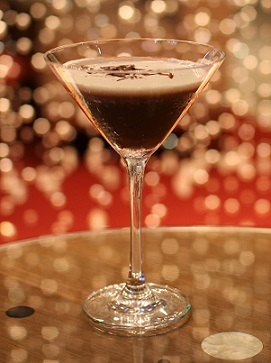 Any occasion will be special when you serve this beverage. A number of the restaurant guests like this so much they nominated it as a favorite restaurant drink recipe. In America, this Chocolate Covered Cherry cocktail "qualifies" as a "cordial." The terms “Cordial” and “liqueur” (USA) often mean the same thing. Many people use the term “cordial” for dessert-like liqueurs that are sweet and flavored with cream, chocolate and similar products. A sweet cordial such as this recipe is most often enjoyed after dinner. I recommend serving this Chocolate Covered Cherry in a champagne flute or martini glass. Preparation time: 5 minutes. Serves 2. If you entertain guests and serve alcoholic beverages I really recommend you visit the article on beverage service at home. Enjoy your Chocolate Covered Cherry drink and the company of those you share it with! Did you know? 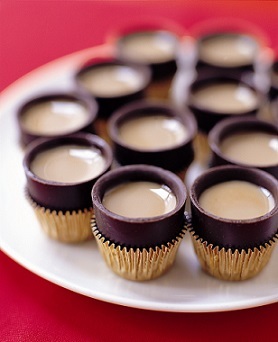 Liqueur chocolates probably originated in France and gradually became popular in America. Cordial candies are made with with other fruits, but cherries are the most popular.